Before retirement, this is how Don spent most of our anniversaries. On this date thirty-two years ago, my husband Don and I exchanged vows with just immediate family and a couple of close friends in a small outdoor wedding on a small hillside in Southern California where we planned to build our first home. Tonight we will celebrate with dinner out at a nice restaurant in town followed by a performance of our local theatre group. We’ll share a bottle of wine and a quiet conversation. Dinner and a show is not a particularly unique way for a couple to celebrate their wedding anniversary, but it is to us. In fact, even being together in the same place on our anniversary is unusual. Or at least it was until Don’s retirement 8 seasons (years) ago. Some people think of August as part of the dog days of summer, those hot sultry days that that make it uncomfortable to even be outside. But to firefighters in the West, August is the smack in the middle of a wildfire season that often lasts until the arrival of Santa Claus. So you might wonder why a young firefighter and his bride would choose to marry during the heart of fire season. The short answer is that we were impatient to formalize our commitment and start our family. And that weekend in August of 1983 was the earliest date that my uncle, a Presbyterian minister living in Colorado, would be available to perform the ceremony. We were not interested in a fancy church wedding, preferring to save that money for the house we were planning to build. In fact, we spent less than $500 dollars on our wedding, the bulk of which went to pay the six-man band that played while 60 or so of our closest friends and family talked and danced in my parent’s backyard in the evening following the morning ceremony. Both scheduled to beat the heat of the late summer day. When we married, Don worked at a county fire station on regular schedule, or as regular a schedule as a firefighter might expect. He worked 24 hour shifts with 24, 48, or 96 hours off in-between shifts. Although station firefighters’ primary responsibility is to their local community, Don often worked overtime and/or would be called away on short notice to provide long term assistance when large wildfires raged. 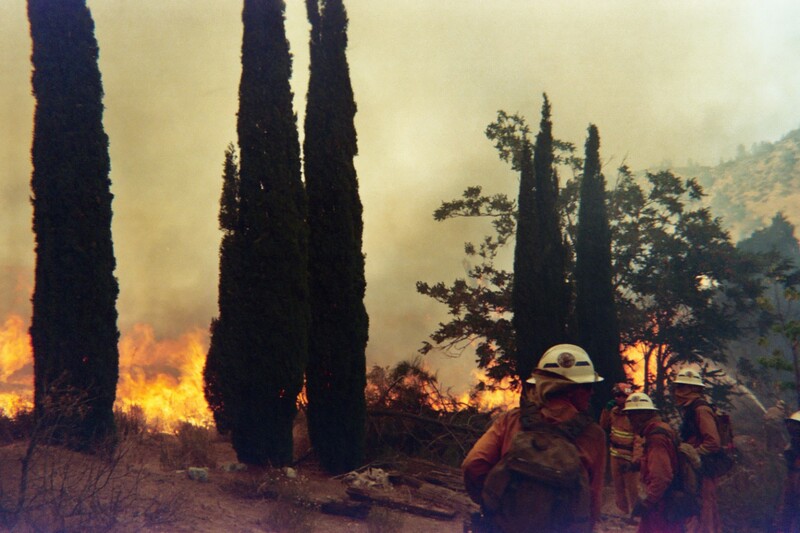 Eventually, the tug of wildland firefighting, something he had done as a “Hot Shot” with the forest service years before we met, seduced him to transfer to the county’s fire camps as an inmate foreman. There he completed his 40 hour workweek in a period of just three days. Which at first blush seems a pretty cushy schedule until you consider that as an inmate crew foreman he and his crew could be sent to a fire with almost no notice and work non-stop (save for a few hours of shut eye) for up to two-weeks at a time. After a mere 24 hours off, they are again eligible to work another two weeks on a smoky, hot, and dangerous wild fire. It was nearly impossible to plan any family time, let alone anniversary celebrations, during a fire season that had been steadily increasing in duration. I recall at least one Christmas and a Thanksgiving or two when Don got a call to report just as we were sitting down to our holiday meal. It isn’t always easy being a firefighter’s wife, but being a firefighter is even harder. It takes a special person to be willing to put his or her life on the line and his family life on hold to do important work to save lives and to protect people’s homes and property. I consider it a small sacrifice that we were not always together on our anniversary. So tonight as we sip our wine and have a proper anniversary meal, we will celebrate our lives together, and apart, and give thanks that Don always made it home from the fires. This entry was tagged anniversary celebration, dangerous jobs, firefighters, inmate fire crews, irregular work schedules, wildland firefighting. Bookmark the permalink.